Daniel Strohl of Hemmings has posted an article on the early designs that inspired the Tucker automobile. For any other company, design renderings largely serve as a means of selling company executives on a car. Renderings of Preston Tucker’s postwar car of the future meant much more as they ended up selling the general public directly on the car. Seventy years later, a selection of those renderings will go on display in an exhibit timed to coincide with the Woodward Dream Cruise. Months before Preston Tucker officially incorporated the Tucker Corporation, the country got its first glimpse of what Tucker had in mind when Pic magazine published Charles Pearson’s profile on Tucker in the January 1946 issue – a profile that included a full-page rendering of the Tucker Torpedo by George Lawson. How many of the ideas expressed in the rendering actually came from Tucker himself is debatable. According to Michael Lamm’s profile of Lawson for the March 1978 issue of Special Interest Autos, Tucker approached Lawson with little more than a vague idea about what the car should look like. Tucker was willing to go as far out as Lawson wanted, because his immediate need was simply for a design – something striking and futuristic. During one of their first meetings at Tucker’s home in Ypsilanti, Tucker asked Lawson to sketch his idea and then model it in quarter-scale clay. George Lawson says he never got an actual “package” for the Tucker automobile – no wheelbase figure, no overall length, not even any specific information on whether the engine was to be over or behind the rear axle. He knew it had to be rear-engined somehow – a 6-passenger streamlined car – but beyond that Tucker couldn’t be pinned down. In response, Lawson dug up a circa 1939 drawing he did while in charge of the Buick studio for GM’s Art and Colour. The drawing, which featured a center driving position, cyclops headlamp, bifurcated eggcrate grille, and swoopy lines, led to his dismissal from GM – Harlow Curtice found it far too advanced – but Lawson felt it fit the bill. To it he added a more canopy-like greenhouse and headlamps atop cycle fenders intended to turn with the front wheels. From that rendering, Lawson sculpted a clay model that appeared lifelike enough to warrant a photo shoot treating it as if it were a full-scale prototype. As Steve Tremulis noted, Tucker “was mounting a public relations campaign in order to acquire a manufacturing plant in which to build his new car, so these images were invaluable in providing his vision of what would be produced in the facilities.” Tremulis went on to point out that without Lawson’s images, Tucker would never have been able to secure the plant in Chicago or capture the imagination of a car-hungry public. 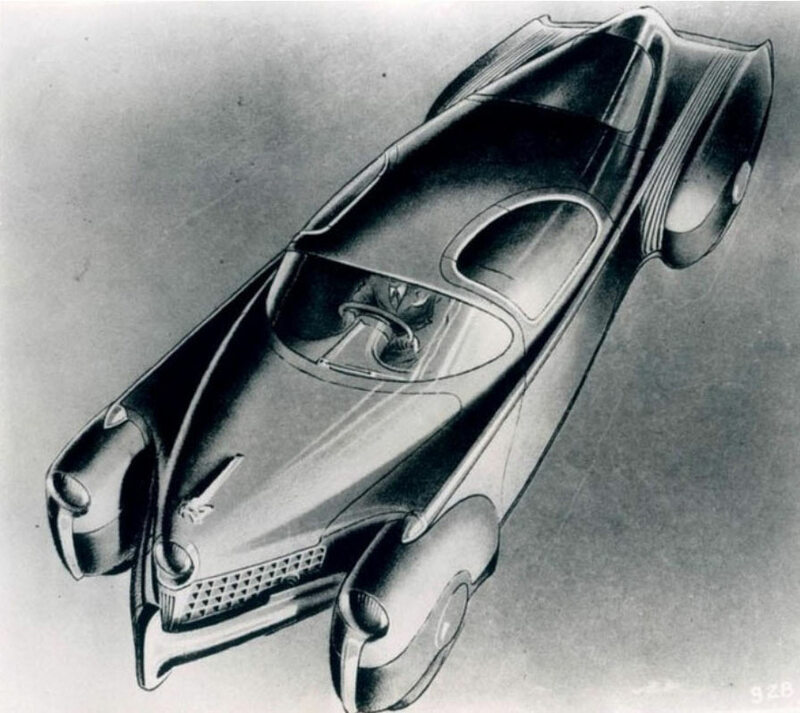 Indeed, Tremulis built on those expectations when he turned his drawings – initially done while still with industrial design firm Tannen and Denison – into the first full-scale automobile to wear the Tucker name, the Tin Goose prototype, within just a few months. 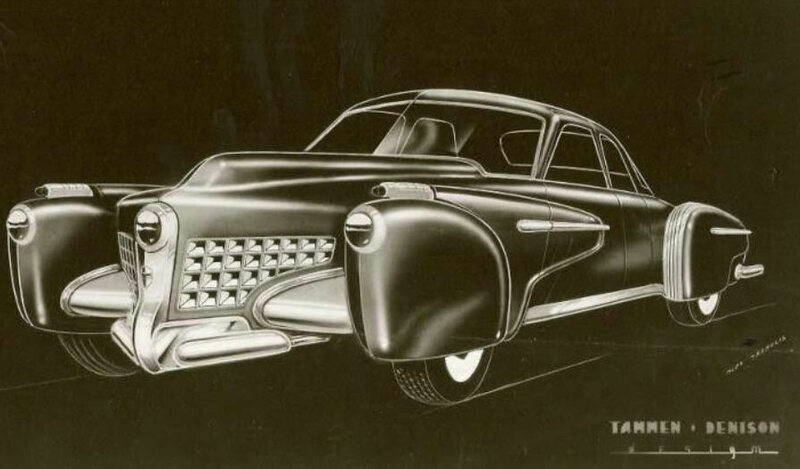 With input from the Lippincott team, Phil Egan, and Audrey Moore, Tremulis would go on to refine, finalize, and take out his own patent on the design of the Tucker ’48 and serve as Tucker’s chief stylist until the end of 1948. John Tucker, Preston Tucker’s grandson, said he’s ended up collecting a good amount of memorabilia related to his grandfather’s venture. Among that collection are a number of concept drawings by both Lawson and Tremulis, some of which he’ll display as part of this year’s Royal Oak Historical Society Museum’s exhibit on automotive concept art. In addition to the Tucker renderings, the exhibit will also include a display of original concept drawings by the League of Retired Auto Designers focusing on rear-engined vehicles and muscle cars. Kicking off the exhibit will be a reception in honor of Robert Edwards, one of the principals of the American Dreaming documentary on auto studio art, who died earlier this year at the age of 60. The exhibit will run August 3 through September 15 at the museum on West Webster in Royal Oak. For more information, visit RoyalOakHistoricalSociety.com.